Guardian Technologies informed us a few months ago that its next flagship would be very different from the rest of their air purifier line, however, for now we will stick with the GermGuardian AC4150. Since our last GermGuardian AC4100 review, there have been more and more questions about why not make one for GermGuardian AC4150. You asked it, and we will make it. Let’s read our GermGuardian AC4150 Review. Ever since we first made the GermGuardian air purifier review, I’ve been waiting to put the GermGuardian AC4150 through its paces more thoroughly. Back then we were impressed with the surprisingly cheap price tags for even the most modern smart features, as well as decent air purifying, which would have put them firmly in the mid-range price band. So, our representative today is in GermGuardian AC4150 Review. Now the GermGuardian AC4150 has arrived, and it’s a little more expensive than the GermGuardian AC4100 at $79. So, with the Honeywell HPA020B already in the marketplace and in roughly the same price band, how does the GermGuardian AC4150 hold up? If you want a $10 discount, you should look at our below deal for GermGuardian AC4150. GermGuardian AC4150PCA 4-in-1 Kids Room Air Purifier, HEPA Filter, UVC Sanitizer, Air Cleaner with Night Light Projector. The 11 inches Kid’s Room Air Purifier with HEPA Filter, Pink Edition. Added with a Night Light Projector to ensure a good night for your babies. The inspiration for the GermGuardian AC4150 is clear – hold it up to a GermGuardian AC4100 and it’s immediately obvious that the American manufacturer has worked hard to improve their $50 air purifier and gain more pieces of market share. There are two color options – pink and blue, which are perfectly suitable for a kid’s room. If you want the Blue edition, or GermGuardian AC4150BLCA, you can grab it for a $10 OFF below. Put the obvious comparisons aside, though, and you’re left with a well-designed and spectacular-looking device. With a small size of 11.5 inches in height and 5.4 lbs in weight, this air purifier is one of the most compact air purifiers in the world. It is even lighter than Levoit LV-H132, which is the Best Seller for compact air purifiers. Guardian Technologies has run the signature back-to-front air flow process, with a full-size air output grill from the front and one air intake grill from the back. For a compact air purifier, I believe this design language is the best to improve the fan power. 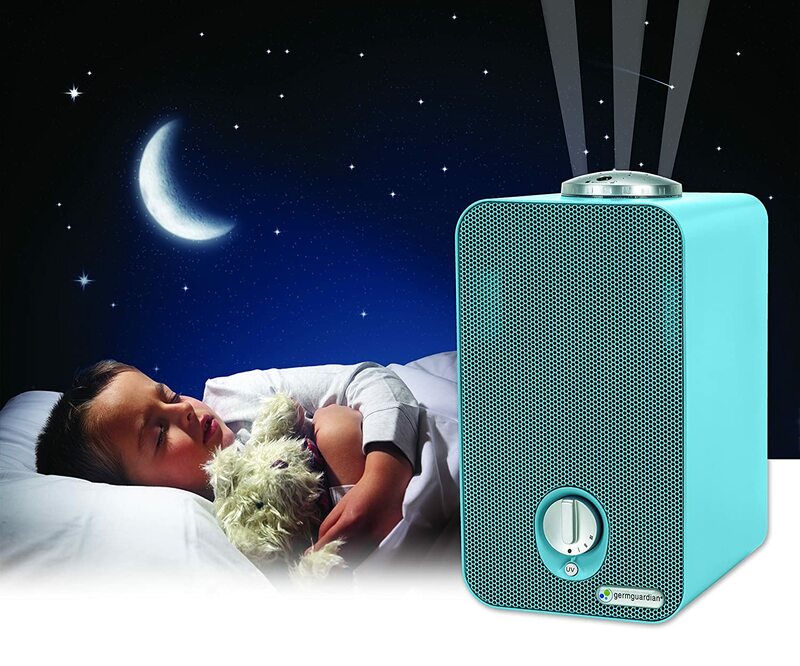 On top of this air purifier, you will find a projector, with 3 optional rotating colors and images to create a night time adventure for your children. When night light is on, you can choose between Twinkle Moon & Stars, Sleepy Safari or Under the Sea theme. Other than the projector, this GermGuardian AC4150 is nothing different from the GermGuardian AC4100, with only one manual switch and one simple button. I don’t want to repeat the same thing twice, but as one air purifier under the GermGuardian name, it is hard to find an unique air purifier (don’t mention the GermGuardian AC5900WCA). Yes, the GermGuardian AC4150 sets exactly the same 3-in-1 air cleaning system just like every brother. Activated Carbon Filter – The normal carbon filter attacks smoke, cooking and pets odors along with harmful VOC’s emitted by common household products. In fact, this filter is a layer to be attached into GermGuardian AC4150’s HEPA filter. HEPA filter – GermGuardian AC4150 only uses a HEPA Filter to capture 99% of dust and allergens, pet dander, mold spores and plant pollen. UV-C Light – The unique 2W bulb with UV-C light to fight germs, kills airborne bacteria, viruses and mold spores. To save the space inside the air purifier, GermGuardian AC4150 combines both Activated Carbon filter and HEPA filter into one physical filter. For a $79 air purifier, I am surprised that Honeywell HPA020B can bring the True HEPA filter (which is better than GermGuardian AC4150 in terms of performance), however, I am not disappointed for the GermGuardian AC4150. With an UV-C light bulb, this air purifier still can kill the bacteria and some of viruses as small as 0.3 microns. Also, the Activated Carbon is necessary to absorb the smelly odors from diaper pale, or your kid’s clothes. 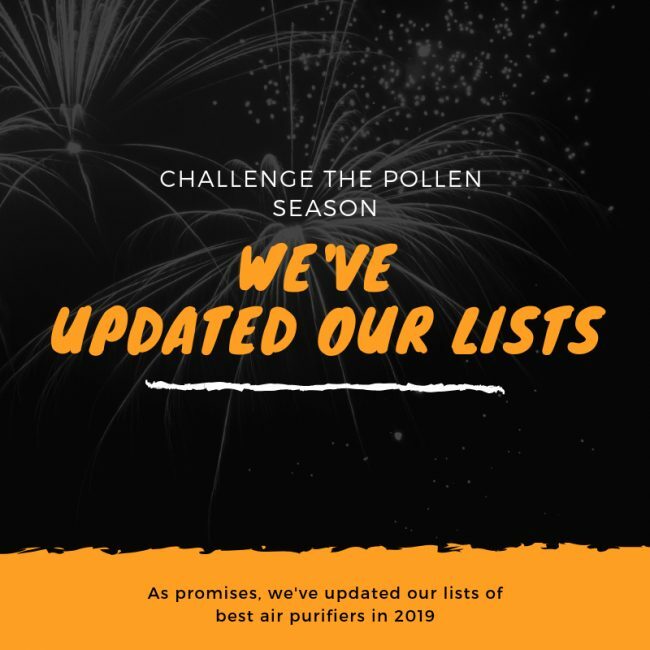 No one can stop their children from activities, but an air purifier is necessary to keep these outdoor allergens outside your home. 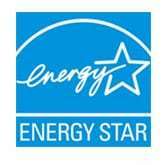 You need to change the HEPA filter every 6 to 8 months. But don’t worry about the filter cost, it is only $24, and is only higher than Levoit LV-H132 or Blue Pure 411 a little bit. GermGuardian AC4150 is just the same air purifier with same size, same fan as the AC4100. That’s why the GermGuardian AC4150 is only for a room of 100 sq ft. The ACH of GermGuardian AC4150 is only 2X. 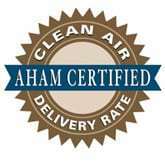 This is exactly the ACH rating of AC4100, which cleans your room every 30 minutes. The CADR of GermGuardian AC4150 is 60 Dust/ 35 Smoke/ 68 pollen (cfm). With a relatively lower CADR rating than AC4100 and Honeywell HPA020B, GermGuardian should be used for a very small room. This GermGuardian AC4150 is famous for it quiet operation on the lowest setting. However, it will generate an unavoidable sound while running on high setting. If you are running on highest setting, please notice not to do that when you sleep. For a quiet air purifier, I suggest you to check Levoit LV-H132 or Blue Pure 411. To be one of the best air purifiers, one device must strictly pass our Breathe Quality test after a long time use. Also, one of the most asked questions in Breathe Quality is: “Do air purifiers use a lot of energy?”. We can all agree that power consumption is one important criteria to review if this air purifier is worth your money or not. Using an only 2W UV-C bulb, GermGuardian AC4150 has a a great power consumption of 45W. 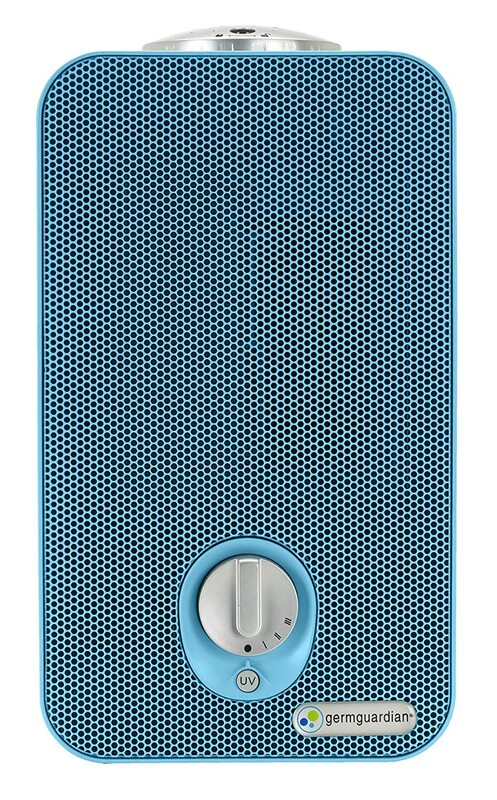 The power consumption is not as great as Levoit LV-H132 or Blue Pure 411, but is still acceptable for a compact air purifier. For using a GermGuardian AC4150 8 hours per day, it would cost you up to $17 per year. Beside the famous Night Light projector, sadly that GermGuardian AC4150 has no additional features. Again, you should not expect much from this price point, as you can’t find a better air purifier with lots of functions. If you want more features, especially a Smart Sensor for this price, you should look for the AeraMax 100 or SilverOnyx 3-in-1. It is also superseded by the latest GermGuardian CDAP4500BCA which is released in 2017, so you should not expect much from an under $100 air purifier. However, for the GermGuardian AC4150 and GermGuardian AC4100, you will only have an 1-year warranty. There’s no denying the GermGuardian AC4150 is a fancy air purifier for your kid’s room. But at $79, you can find a “true” air purifier by looking for Honeywell HPA020B, or you can upgrade to a $100 Levoit LV-H132 or Blue Pure 411 for better performance. Should I buy GermGuardian AC4150? Yes, just $20 for the light projector is okay to upgrade your GermGuardian AC4100. The GermGuardian AC4150 is cheap, and it provides decent air cleaning performance for the price. If you have serious allergies or asthma to airborne pollutants: the GermGuardian AC4150 is great with the combination of HEPA filter and UV-C light filter. If you want a better performance, or better fan power to clean your room faster: in this price range, the GermGuardian AC4150 has an average fan power. If you need an air purifier with a better room coverage: you can buy the GermGuardian AC4825 or GermGuardian AC5000. If you care about the annual filter cost and energy cost: the Blue Pure 411 and Levoit LV-H132 are better options for you. In the most low-range segment of the market, GermGuardian AC4150 aims at kids and kids only.